As you can just make out (sorry, white board pen sucked) yesterday I made a Tic Tac Toe board in my grade 3 class - I got this idea a while back from another teacher and it's an easy way to practice speaking. However, in this post I want to explain how we can use this for older students as well as the really young students (grade 1 and 2). This Tic Tac Toe game can be used with grades 3 and go right up to grade 6 if you adjust it right. It is similar to the snakes and ladder speaking game I play as well - to see more on that, click here. For grade 3, we were studying a lesson about shopping and it was based around the phrases "I want a _______." , "How much is it?" etc. So during class I drew the board up with their help. Asking them for what we can buy in our little shop. They came up with orange juice, a toy car and a pencil case as these are in their textbooks. 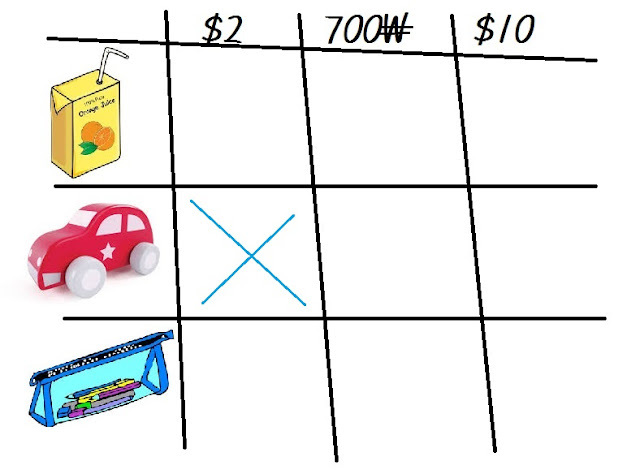 Next, the prices - they came up with $2, 700₩ and $10. B: Yes, please. I want a _________. The speaking part of this is to complete the dialogue based on the X or O written in the grid. The grid looked like this, if I made it on computer lol - this is so you get a better idea, than the pictures I showed earlier. I made this quickly in paint. You could always click this to enlarge, save image and print it out. How does the game work? Well - it's super easy, you just play Tic Tac Toe... 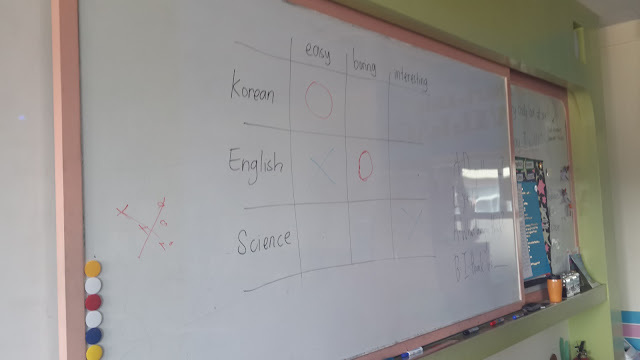 I only had 4 students in my class, so we played 2 games , giving each pair a go at battling each other, then one final game between the winners. But, if you have a large class split the class into 2 teams OR boys vs. girls. So, player 1 comes up and chooses a box to draw their 'X' or 'O'. Next, player 2 from the opposing team must complete the dialogue I wrote on the board, with player 1 - and it all should be according to the mark that player 1 left on the Tic Tac Toe grid. B: Yes, please. I want a toy car. Next, player 2 marks their O. A: It's seven hundred won. Can you dig it? Easy right? You just repeat this until someone wins or it's made impossible that they can win anymore. It's great because you'll hear the classmates yelling/cheering in English "toy car- $2!" or "pencil case, $10!" so they're constantly speaking English and they get really good with the dialogue. I'd play at least 2 games if I had time, you could go on for longer also. The kids really get into it. 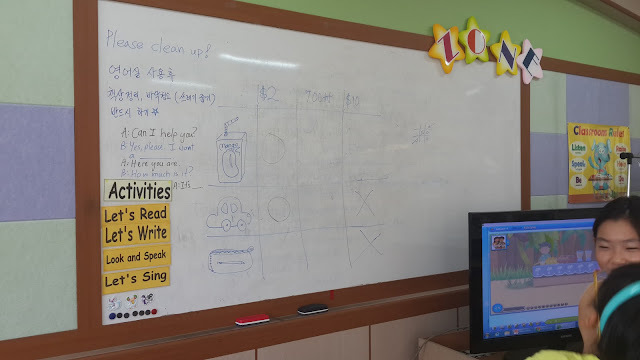 Also, another option is to make a grid like mine and print it out for each pair in the class and have them play it alone and check that they are practicing the dialogue. Write the dialogue on the board for reference. As you can see, you can adjust this to any topic, add more lines to the dialogue etc. Here's an example for grade 6 lesson : What do you think? A: I like ______________. What do you think? B: I think it's ______________. A: Do you like ____________? A: I think it's _____________. What do you think? B: I think it's _____________. B in the last sentence has the freedom to come up with a new word or choose from the 3 on the grid. 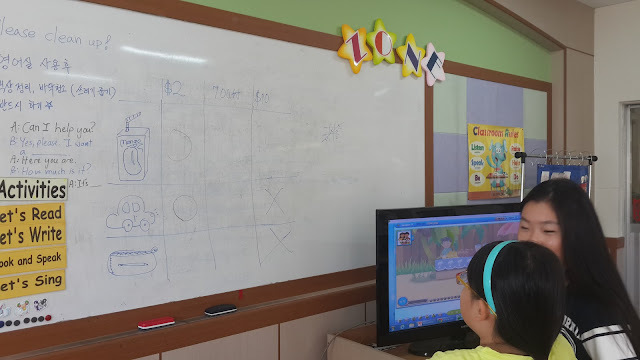 So when I played this game with 3rd grade, an idea for grade 1 and 2 started brewing. As I am always trying to think of new games to play with them. 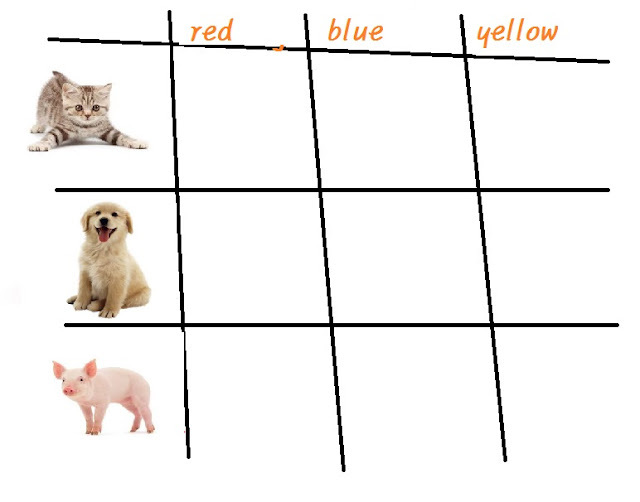 Now, my little ones know quite a few foods and animals as well as their colors (you could do numbers instead). 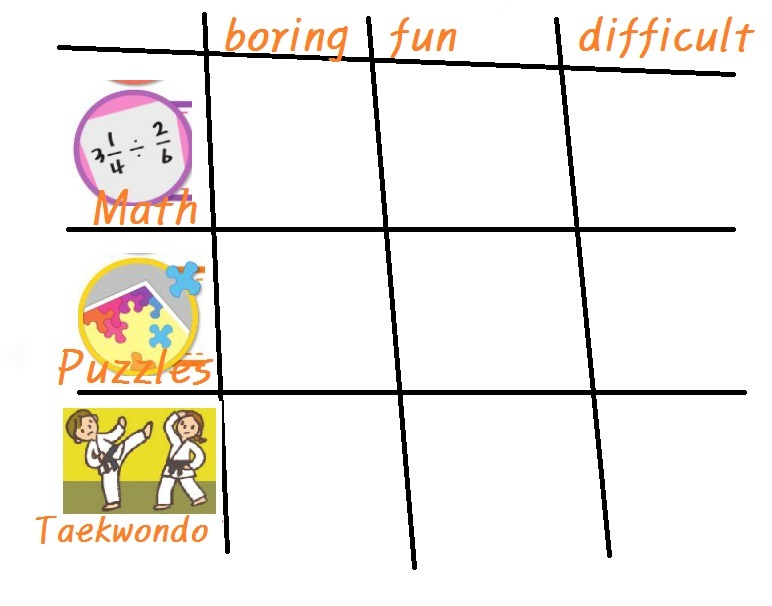 So I am planning to play a team style full class Tic Tac Toe game with them - using this style board, which I will either draw up with them in class (I draw fast, and I they like to watch and guess what I draw) or I will have a few grids on power point, project it and they draw on the whiteboard/TV while it's projected. "It's a ______ _______" - "It's a blue dog." Easy sentences they can say. They can just say it all as a class after the player has marked an X or O.